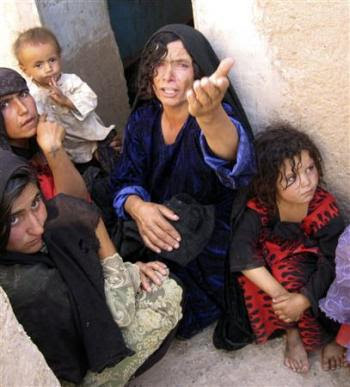 An Afghan woman who lost family members weeps after air strikes on Friday in Azizabad district of Shindand August 23, 2008. An UN investigation suggested that 60 children were killed in the airstrike. Australian troops are not restoring peace in Afghanistan but working for oil company profits, amongst other things. But Prime Minister Kevin Rudd has paid tribute to nine soldiers who were wounded in battle, one of whom has life-threatening injuries, and said the Government remains committed to restoring peace in Afghanistan. The troops were members of a Special Operations Task Group (SOTG) detachment fighting an overnight battle with the Taliban in Uruzgan province. Mr Rudd has told Parliament the operation is still continuing and says Australia will continue to help Afghanistan in the fight against the Taliban. "The Australian Government remains committed to assisting the people of Afghanistan and their democratically elected Government to achieve a measure of the stability and prosperity that we take for granted in our country," he said. "Our adversaries should take heed of the resolve of Australia's soldiers, the resolve of the Australian Government and the resolve of the Australian people in bringing to an end this unsustainable instability and conflict in Afghanistan. Mr Rudd said those still involved in the operation were undertaking essential but dangerous work which was part of a vital mission. "The Taliban can never again be allowed to use Afghanistan as a training ground, a hiding place or a launching pad for terrorist operations around the world," he said. Five of the soldiers have serious wounds and three others have slight wounds, while one is seriously injured. Earlier today Chief of the Defence [military] Air Chief Marshal Angus Houston confirmed the troops were ambushed. "It's a very dangerous place and we were involved in an activity with other forces, and I guess we were ambushed and this is what happened," he said. The incident follows the death in July of 25-year-old SAS Signaller Sean McCarthy, the sixth Australian soldier to die in theatre in Afghanistan. On 22 August, 95 civilians were killed by NATO forces, 60 among them were children. Yesterday 1 September another 70 civilians suffered the same fate. Afghanistan does not make the news; Afghan lives seem not to matter to the so called "civilised world". 7 October 2008 marks the seventh year of Afghanistan’s occupation. The NATO led International Security Assistance Force (ISAF) is made up of over 50,000 NATO troops, of which about half are US soldiers. Australia under operation SLIPPER provides 1,080 Australian soldiers. NATO has killed actually more civilians than the Taliban, this is just one of the reasons why the resistance to the occupation is increasing. The US alone spends $100 million a day in Afghanistan’s war, while total international aid comes to $7 million a day - most if not all is 'boomerang' aid. The US puppet regime of Hamid Karzai exerts control over no more than 30 percent of the country. After the US led invasion Afghanistan has become the ‘opium capital of the world’ and foreign soldiers are much involved in opium trade as the warlords. The 2007 Afghanistan Human Development Report shows some catastrophic development indicators: access to water is at 31% of households; life expectancy is 43.1 years; adult literacy is 23.5%; 50% of Afghan children under five are malnourished; while 6.6 million Afghans do not meet their minimum daily food requirements. Violence is up by 50% in a country where suicide bombings had never been seen before December 2005. RAWA, the lead Afghan women’s rights group, says the US backed regime in Kabul is no improvement for Afghan women. Malalai Joya, a leading Afghan politician also called the ‘bravest woman of Afghanistan, has denounced the warlords, Karzai and the endemic corruption. Malalai has also called for all US and foreign troops to get out of Afghanistan and allow Afghans to run their country. Australia is aiding and abetting in a disastrous occupation. Foreign troops have not brought democracy to Afghanistan but chaos and misery. Join our call to: BRING THE TROOPS HOME! JOIN THE STOP THE WAR COALITION - SYDNEY ON TUESDAY 7 OCTOBER 2008 AT 5.30pm AT SYDNEY TOWN HALL. Australian special forces troops detained suspected Taliban militants [or indigenous Afganistanis] in "dog pens" in actions which have prompted a protest from the Afghan ambassador. Investigation last week found mass NATO Killings of 90 Afghanistan Civilians including 60 Children. "Investigations by UNAMA (United Nations Assistance Mission in Afghanistan) found convincing evidence, based on the testimony of eyewitnesses, and others, that some 90 civilians were killed, including 60 children, 15 women and 15 men," U.N. Special Envoy to Afghanistan Kai Eide said in a statement. The reported death of the soldier in Afghanistan would be the second loss Australia has experienced in the attack on the sovereign nation state this year, and brings the nation's death toll from the war to six. Oil production has climbed to a post-war high of more than 2.5 million barrels-per-day. Iraq has raised oil exports to a post-war high, earning billions of dollars to fund reconstruction after Baghdad cracked down on sabotage of its strategic pipelines, Oil Minister Hussein al-Shahristani says he expects 2008 oil revenues to reach $70 billion if oil prices stay high and there are no output disruptions. Mr Shahristani was optimistic Iraqi forces would be able to sustain tight security at oil facilities. That could raise the confidence of [foreign] investors who have been discouraged by [resistance to; the pre-emptive strikes on Iraq by the coalition of the killing, false flag operations by them, to encourage civil war, sectarian violence, Al Qaeda and powerful Shiite militants who had a tight grip on Basra, home to Iraq's biggest oilfields. "In May, we have exceeded for the first time 2 million barrels-per-day (bpd) as an export rate," Mr Shahristani said. Production had also climbed to a post-war high of more than 2.5 million bpd, he said. Mr Shahristani was confident Iraq could pump up to 2.9 million bpd by the end of 2008. 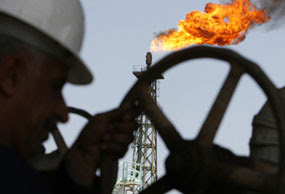 He declined to comment on export levels for June, but senior Iraqi oil officials said last month shipments would run slightly higher because of extra Kirkuk sales from the north.